Crafttuts+ is all about teaching you how to embark on exciting craft projects that you’ll be desperate to try out. We’ll be publishing amazingly high-quality, clear, and visually impressive tutorials that are simple to follow. As well as fun one-off projects, we’ll have several sessions that take you through the basics of different types of craft — so you’ll have a solid place to start learning techniques to build upon later. We’ll be publishing a combination of step-by-step written tutorials and screencasts/video lessons. In most weeks we’ll be publishing 4-5 high quality tutorials, so make sure to subscribe/follow Crafttuts+ below so you don’t miss a thing! 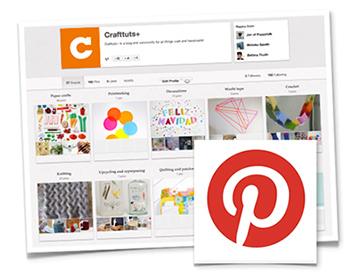 We’ll be making the most of Pinterest, and carefully curating our own set of boards to keep track of our favourite crafty projects and inspiration. As well as sharing our latest tutorials on there, we’ll be highlighting the work of our authors, favourite crafters, and much more! Thanks for being part of the site, and we hope you’ll enjoy all the crafty projects we have lined up over the coming weeks! To celebrate the launch, we’re running a competition to win $300 to spend on craft supplies and goodies! Whether you’re in need of new crafty supplies, books, materials, or anything else, this is your chance to win a fantastic prize.